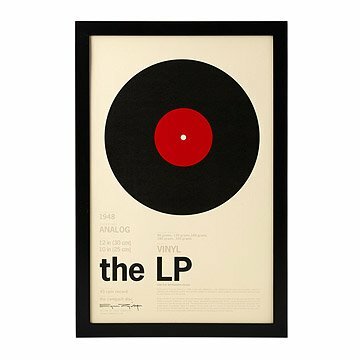 Gene Rogovitz created his stark "infographic" series as an homage to well-known objects, like the LP. Inspired by how vintage encyclopedia graphics achieve the maximum visual impact with deceptively simple and minimalist layouts, artist Gene Rogovitz created his stark "info-graphic" series as an homage to these bygone books and well-known objects. His LP print is doubly nostalgic as it also captures the excitement the artist felt when he received his first turntable from his father at age 13. At a time before the CD and light years before the MP3, the way to spin the hits of the day was on an LP. Like an artifact displayed in a museum, Rogovitz memorializes this covetable piece of retro recording in his punchy print that is filled with facts about the LP's first appearance and the history of the design. With timeless graphic appeal and a slick aesthetic, this print will hit home with your favorite music aficionado or vinyl collector. Designed and printed on Long Island, New York. For more prints in this series, check out The Skateboard, The Surfboard and The Bicycle. Framed version arrives ready to hang. Unframed version arrives rolled. Great print, dirty frame, nice gift. The print was wonderful. The framing, not so much. It was dirty and I had to take it apart, clean it, and put it back together. The lettering on the poster was very light in places, almost unreadable and I believe that effected the quality. Print perfectly highlights music area in the living room. Excellent communication throughout the process. Original shipment was damaged and lots of questions from representative to troubleshoot. Sent replacement that arrived in three days. Totally different packaging and no damage. Customer service was prompt, thorough and efficient. Will order again!!! Bought as a gift. It looks great! Now I want one too! Wish it was a little "sharper"
Awesome gift for the record lover! This is a Valentine's Day gift for a loved one who is a record collector. He absolutely loved it! It really is a beautifully designed graphic with great information about the LP. I bought it framed and it looks really great. I was very happy with the quality and even more happy it was such a well received gift.